I arrived at the venue at Clapham Junction to discover the training course I was due to attend had been cancelled. Others were annoyed about this. Admittedly it was all a bit inconvenient, plans had gone awry and if people were to travel back to work it would hardly be worth it. A day wasted! So I kept to myself the recognition of a golden opportunity for a slow drift back across London to eventually catch the train home, sometime after lunch. It seemed the obvious thing to do to me. But I knew others would consider it unusual, maybe baffling and possibly even reckless and irresponsible to embark on such acivity rather that try to get back home or even work as quickly and directly as possible. 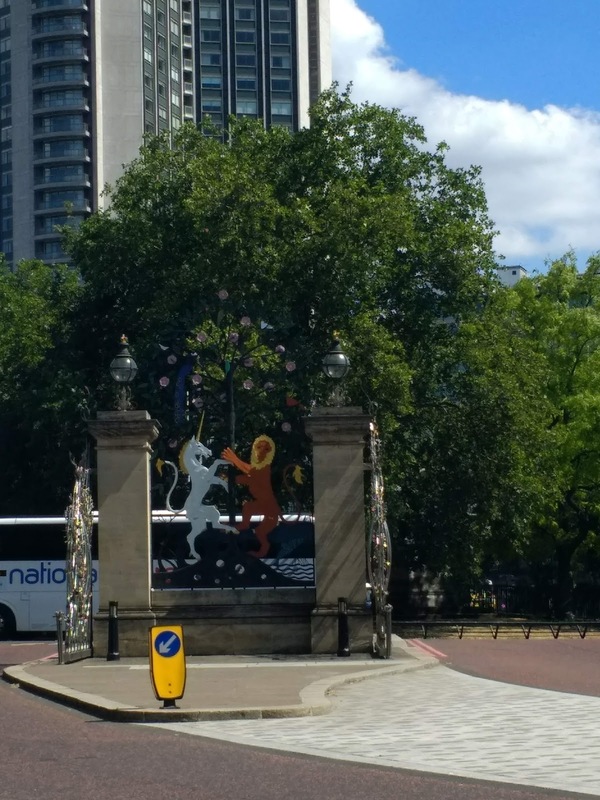 The poster I saw later somewhere near Hyde Park appeared as sign of solidarity. As if put there by a support group offering self help memes for psychogeographers and flaneurs. Support for an activity some might consider a bit immoral: an act of idling, inefficiency or time wasting. Of not taking the direct route. Prior to this revelation (the relentless sun, the need to pee and for a drink of water possibly intensified the importance of the notice), my wander had commenced at Falcon Road and through a bit of Battersea. Here I got earworm of the song 'Up The Junction', from the 60s film which was set in these parts, which intensified each time I approached a traffic junction. The frequency of traffic junctions seemed higher than normal. The song faded as I came across a way to the Thames Path, around the side of Falcon Wharf, a large Ballardian appartment building. Heading into the Thames Path involved skirting the base of the building, which appeared to house a high end hotel and appartments with amenities including a 'wellbeing spa' and a 'baketique' according to the signage. Haven't spas always been promoted as having associations with wellbeing? As for 'baketique', I had to look that up and discovered it is a term for an establishment selling American cupcakes. The internet says this one is permenently closed. The recent cupcake craze is evidently at an end. I've never been sure of the difference between cupcakes, muffins or 'buns' as my nanna called the ones she made. My nannas only came in chocolate or 'plain' flavour. Cupcakes meanwhile seemed to be available in an infinate variety. Too much choice possibly confusing even the most 'sophisticated' consumer was probably their downfall as much as price and sugar content. 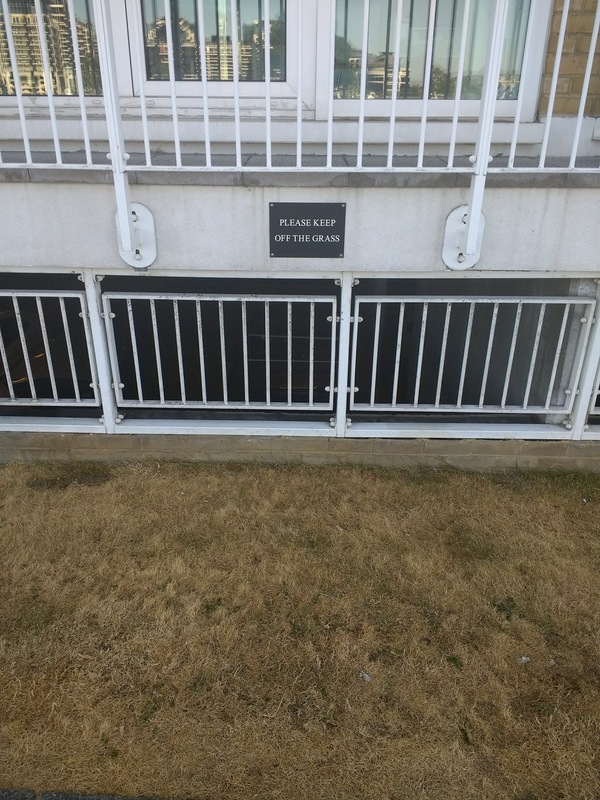 Round the corner, a posh woman was rebuking a young man who had been cleaning the railings and then proceeded to empty the contents of his bucket into the river. She'd approached him and told him what he had just done was illegal. Maybe it was. But I'd have thought his 'crimes' would pale into insignificance when compared to the history of people polluting the Thames and I doubt he will be responsible for the next cholera epidemic or doubling in size of London's Fatbergs. Not hanging about to witness the outcome of the womans overzelous intervention, I carried on along the river path past several new developments I imagined were designed for the 'exclusive' end of the market . A notice politely asked 'please keep off the grass'. The grass in question was a narrow strip so small it seemed barely worth maintaining and the sun had done it's best to bring about its demise. 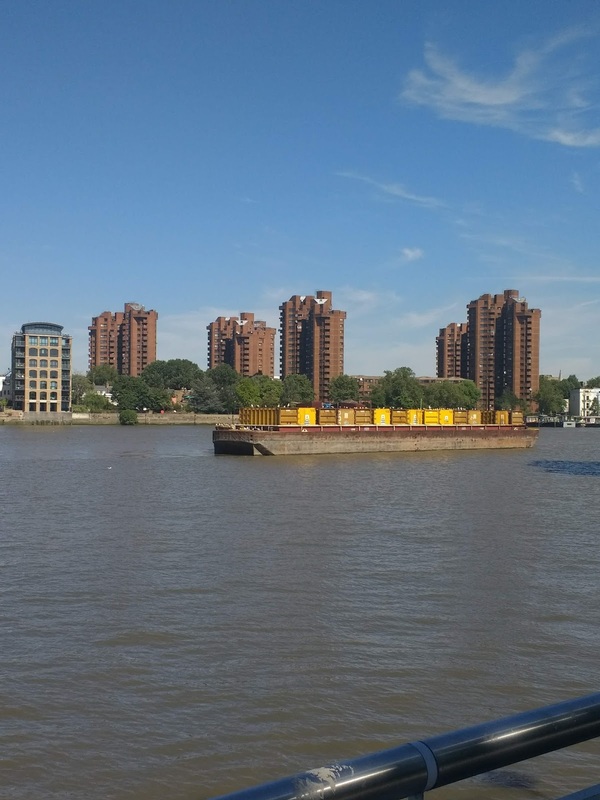 Across the river, I had noticed a cluster of tower blocks. Rather than the usual grey concrete, or modern steel/glass they appeared to be made out of brown brick. A high rise version of Wentworth Prison perhaps. Or maybe more exclusive flats, from an earlier period. A Sloan Ranger Thamesmead. 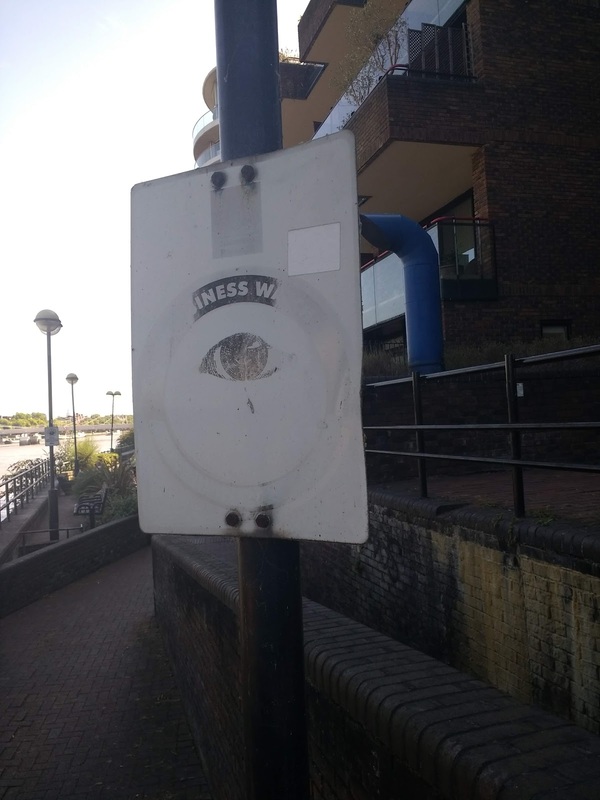 The effectiveness of 'business watch' looked in doubt, the eye on the fading notice deteriorating as if afflicted by a cateract. I carried on without observing much else of interest until I got to Chelsea Bridge. I'm sure there were things to notice but I'd gone into a sort not-noticing state, a combination of the rythm of walking gently and the brutal heat as time moved beyond midday. From this point my walk took in numerous other figures and statues. The Colossus above seemed to be standing in defiance of the towerblock opposite. 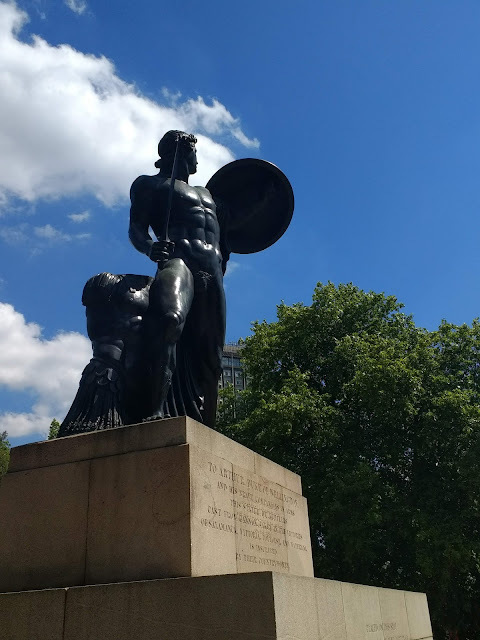 This isn't shown that well in the picture, but I couldnt get an optimum angle due to some excitable Italian kids playing frisbee around the base of the statue. The shield from this angle resembles a large friabee, or discuss, which may explained their presence. Out of Hyde Park and onto the concrete square of Marbel Arch, I came across a behemothic green something. 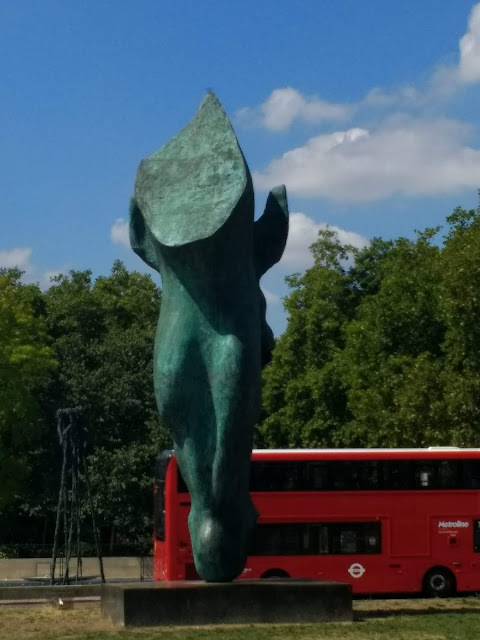 A giant headless semi-amorphous beast from an imagined collaboration between Ray Harryhausen and Salvador Dali appeared to be heading towards me. The square was like a 60s concrete version of a classical square, the Marble Arch looming over it. The sort of place Sinbad or the Argonauts would fight beasts or animated skeletons if they were living in a semi-brutalist age. Voices sought my attention. Not skeletons with swords, or allies in the fight against the giant beast, but tourists wanting me to take their picture in front of the Arch. I obliged, hoping I'd pressed the right button on the camera before wishing them a good day and leaving the square. Along Oxford Street I fell into line with the tide of shoppers drifting in the direction of Oxford Circus. 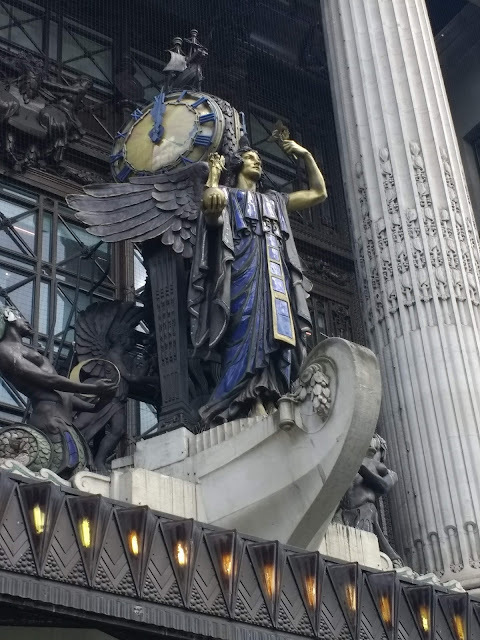 Looking up, the splendid art deco statue of the winged figure above Selfridges looked like another Harryhausan creation. I half expected it the creek into life and fly across the sea of shoppers and tourists who were probably too focussed on the ground floor to have noticed it. Soon after crossing Oxford Circus I headed left into Fitzrovia/NOHO and soon located The Champion where I stopped for a swift half and a bag of crisps. I was glad to see it looked barely any different following its recent refurb, and still offered haven of welcoming dark brown and shade. Particularly welcome given the intense heat and bright sun outside. I resisted the temptation to visit the Blue Posts or the Fitzroy Tavern and wound my way towards Tottenham Court Road. I followed a narrow passage which emerged into a courtyard. On a platform outside a first floor window was an unusual display. A strange boy like figure breaching towards a manequin, with a cast of supporting but no less odd figures dotted about, inside a white frame. What this meant I had no idea. I continued down the passage and out eventually of Fitzrovia. 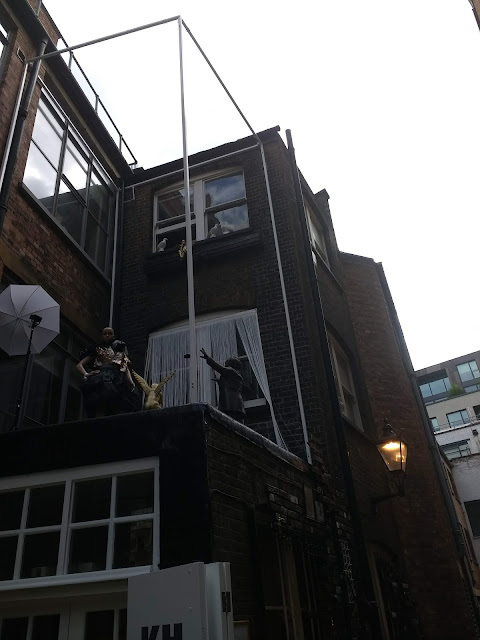 Not long after this I found myself in the vicinity of the University of London and the streets around Mallet Street where the ULU building still seems to put gigs on. 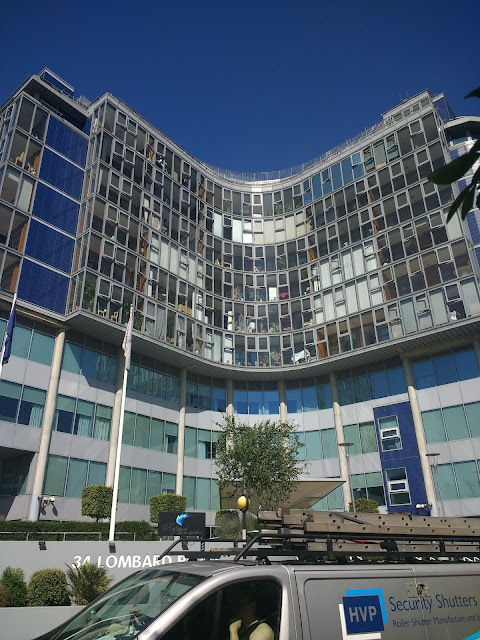 The buildings are large, flat roofed and brown sporting crittle windows. This brought to mind images of boffins in white coats huddled over testbtubes or bearded, rollnecked open university types standing in front of writing beamed from an overhead projector onto a wonky screen. Along this stretch somewhere I saw the message below on a telecoms/electricity box. 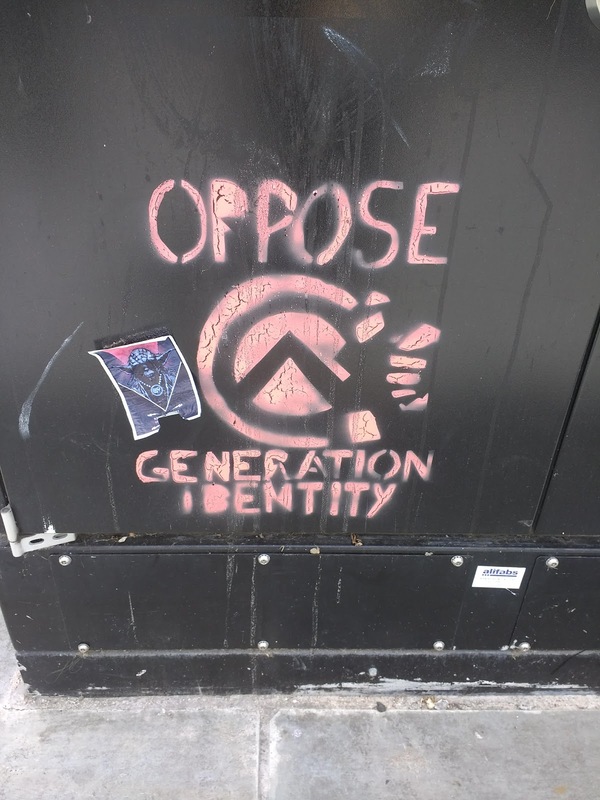 What is to be opposed is a far right organisation. I'd not heard of them so googled the term, only to find I was being diverted somewhere within 5 seconds. I twigged it was dodgy and further Google searches confirmed the worst. 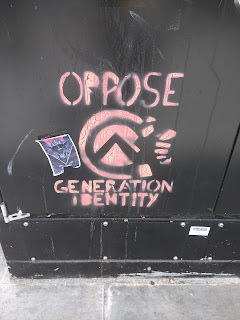 Before this I had assumed it was the work of people not wanting to be labelled 'millenials', ' gen x' or babyboomers etc, given current attempts to divide people by generation as well race, sexuality, gender, class and suchlike. Emerging from the University area into Tavistock Square I passed The Tavistock Hotel. I was familiar with it, having stayed there a few times many moons ago. 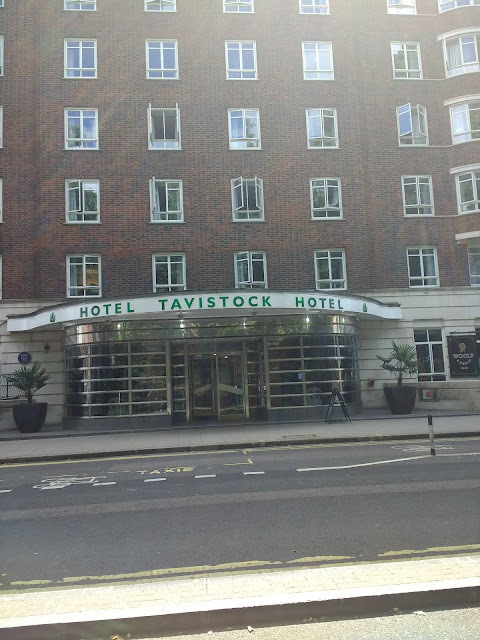 It was one of the few London hotels within our price range. It was a bit like going back in time to it's 1930s(?) art Deco era. The waiters and waitresses in the large breakfast room.were dressed in black and white, and appeared to have been there for an eternity. There was a satisfying ever so slightly damp smell in the rooms which had not, thankfully, been modernised. My last memory of the vicinity was going the the Bloomsbury Bowling Lanes located in the basement on one corner of the hotel, to see The London Dirthole Company. There were people playing bowls while the band played i think. Sadly I didn't stay in the hotel on that occasion. A final pertinent message from Virginia Woolf, echoing the sentiments of the Hyde Park Poster, was quoted via the hotel bar windows: 'The Streets of London have their maps, but our passions are unchartered. 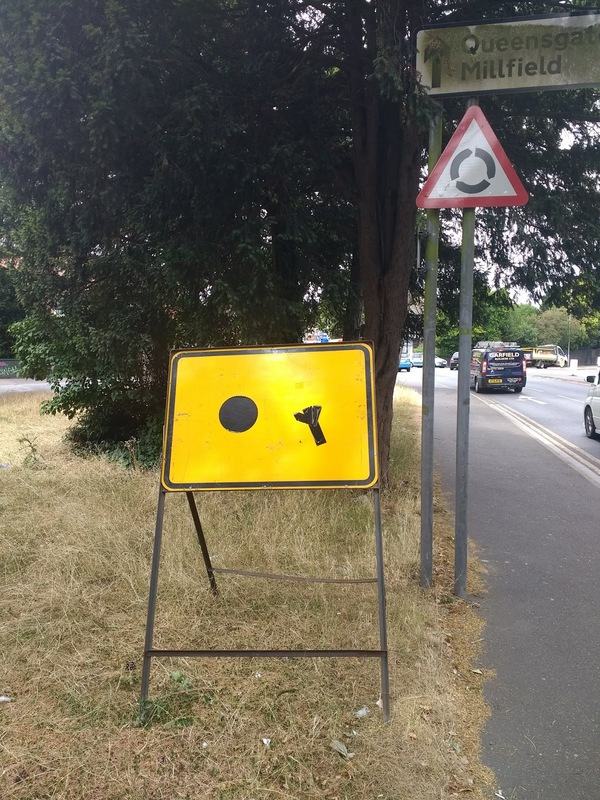 What are you going to meet if you turn this corner?' The ghosts Bloomsbury were on my side, advocating not taking the direct route. I wandered away from the river past the Key Theatre, where a group of office workers were hanging around outside, evidently undertaking some sort of team building activity or training. Flipchart paper was stuck on the windows where they congregated. Otherwise the building looked deserted. The cafe/restaurant/bar which was partly what attracted me over in the first place, was closed. Maybe the office workers were planning a strategy. If they were, it looked like they were unsure of what it might be and were in no rush to reach a decision. Just past the gathering I noticed a white box like brick construction half emersed in the ground like a bunker. There was a sort of grill through which some sort of electronic device was kept. Maybe meters for utilities, but it seemed an odd place to keep them. 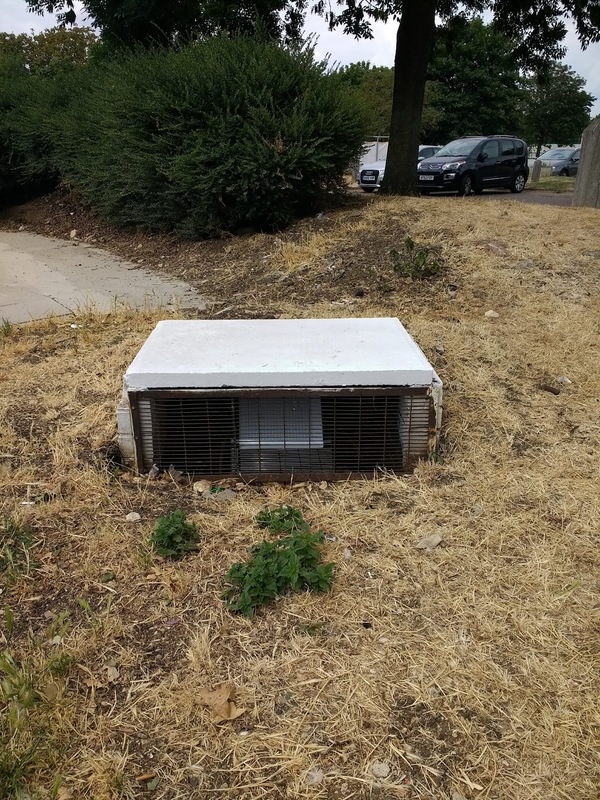 It looked like an oversized microwave oven made of brick, or the back of a refrigerator that was buried three quarters into the ground. It was facing directly at the theatre and the office workers, as if observing them. Just before I encountered the office workers, I had seen another 'box'. This one had been smashed up, the lid and grill had gone and the electronic device was exposed. I hadn't taken much notice until I came across the second one, still in tact. What these bizarre structures were, or what the devices inside them did, I had no idea. Who had smashed up the first? The office workers? Had they been overcome by some terrible malaise causing them to destroy technology that frightened them, similar to the situation described in the peculiarly sinister children's TV series 'The Changes'? Perhaps they knew something the rest of us didn't and were planning on fleeing the city to find a safe haven in the country, or at the coast, or in France. Somewhere away from the constant stare of the observatory bunkers. On the way home from work, near the station waiting to cross the road I witnessed a bizarre figure go by on a motorbike. It wore a vest made out of what looked like armour over a leather jacket, metal gloves and boots and a horned helmet. The latter made the head resemble a junior version of the 'Scafolk Beast'. A devil-biker. Psychomania. Music was emanating from the motorbike which was decorated with horns and other pariphenalia. A being sent through a gap in the fabric of space and time, from an age of early 80s Italian Mad Max rip-off films. An Exterminator of the Year 3000 from a place where water is so scare people kill for it, while fuel, guns and ammo are plentiful. Today the first hospipe ban in Britain was announced. We haven't had rain for about 2 months. Could the appearance of this post-apocalypic figure really be a coincidence? I later discovered this was in fact the 'Viker Biker', a local 'character' who assumes a part Viking/part knight persona and is probably the nearest thing Peterborough has to a superhero. He says if he happens to be near someone in trouble he trys to help, and he seems to want to cheer people up. If I'd have been watching About Anglia closely enough in 2005 I would have already knew all this. More certain that apocalypse by drought was unlikely having seen some clouds and the About Anglia clip, or that gangs dressed in spikey leather driving spikey cars were not about to start maurading in the remains of a desolate East Anglia, my mind was diverted to 'characters' that inhabit every town and city. Cambridge has had its fair share over the years, Disco Kenny, The Man-With-The-Loaf of bread on his head, IRA Shouty Man and many others. 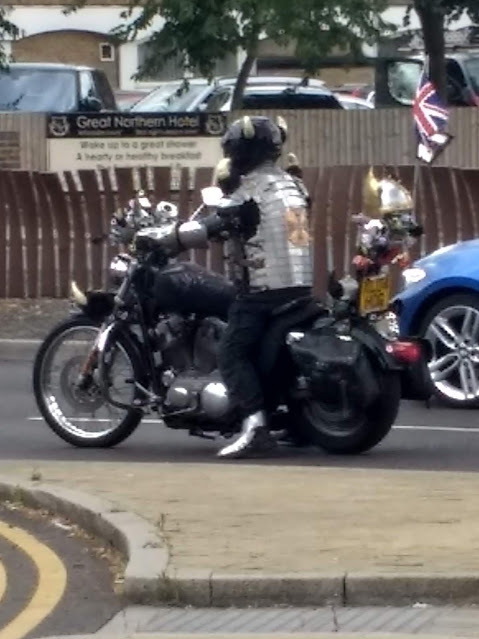 The nearest Cambridge has to the Viker Biker is Heavy Metal Biker Man, a bloke on a racing bike with a ghetto blaster in a plastic bag that blasts out tinny heavy rock. These people are essential parts of the city they inhabit. Like human pieces of 'folk art' they are creations of themselves alone, often by accident. They are the antithesis of the 'clone town'. Long may they continue. The recent prolonged hot spell finally over. I'd been lethargic, mush brained and irritable. Not inspired to walk, blog or do anything very much else. But today I felt newly energised, lighter, in need of a wander. Lunchtime I headed out, no destination in mind. I passed an avant garde road works sign, depicting what looked like a black sun and a torch, which by a trick of light had it's beam provided by the real sun. A sign that pointed the way, encouraged me to take my time, do a longer walk than usual if I felt like it (I did). I turned onto Lincoln Road, deciding to head in the rough direction of the Hand and Heart pub, my only point of reference for the area. This part of Lincoln Road is a somewhat ramshackle and dilapidated affair. The buildings are a crumbly. The street brought to mind how I imagined somewhere like Hackney to have looked in the 70s or 80s, or maybe Bradford as dipicted in the film East is East. The latter maybe due to the obvious multi-cultural character of the area. There is a large Muslim population as well as a Portuguese and Eastern European presence. A mural on the back of a large food shop celebrated the community of the area, known as Millfield. 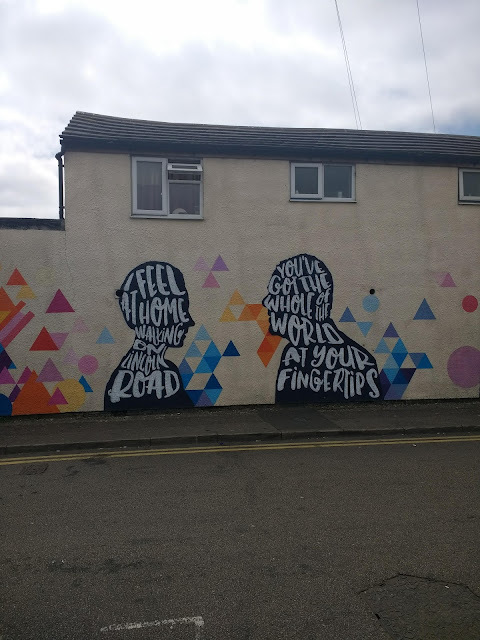 The feeling was different to that of Mill Road in Cambridge where a mural on the bridge has similar sentiments. 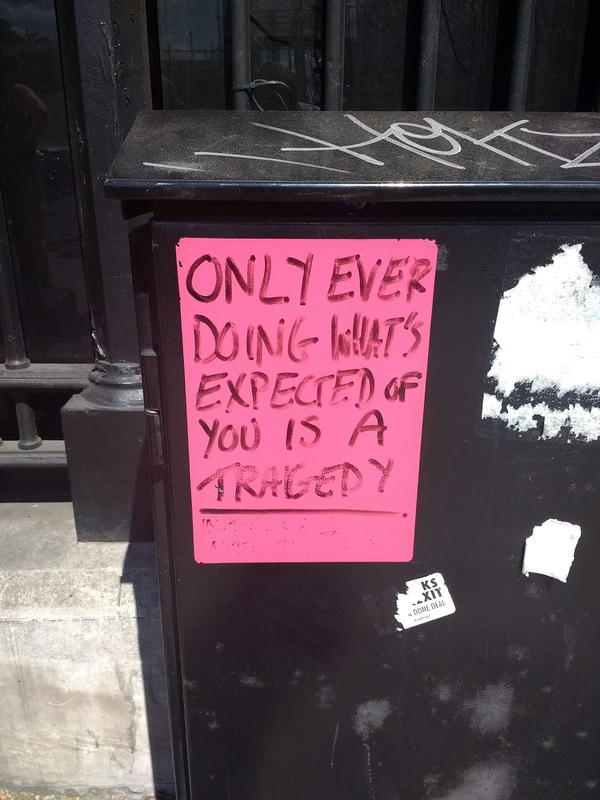 Or the hipster streetart of Hackney and Shoreditch. This felt more of an honest attempt at creating cohesion and part of an effort to heal tensions that had existed in the past, created by the people involved rather than the remote concerned. There were no signs of the middle class 'do gooder' to be seen. Not far from here on a back street is the Hand on Heart. 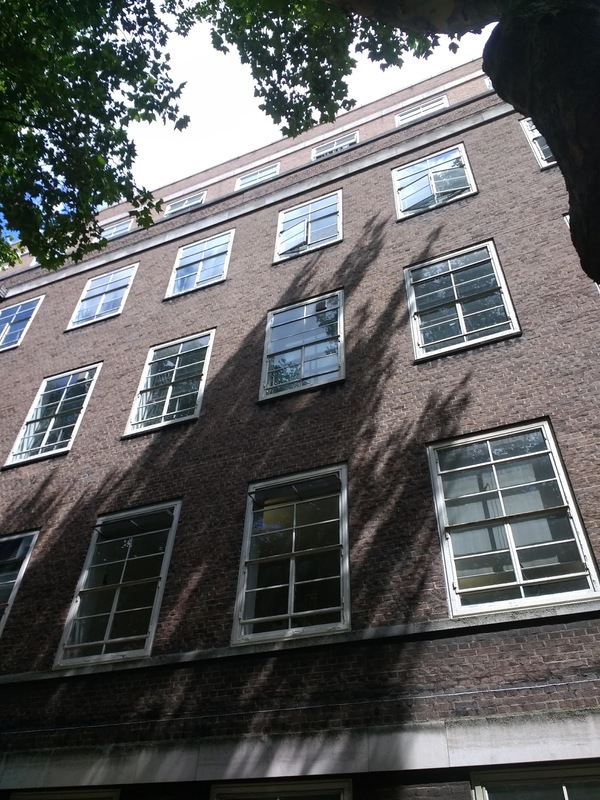 The 1930s flat roofed Square building is both utilitarian and spectacular. It's renowned for keeping the best beer in Peterborough. The sort of back street pub that is rare as hen's teeth these days, but once would have been a ubiquitous feature of most towns and cities. 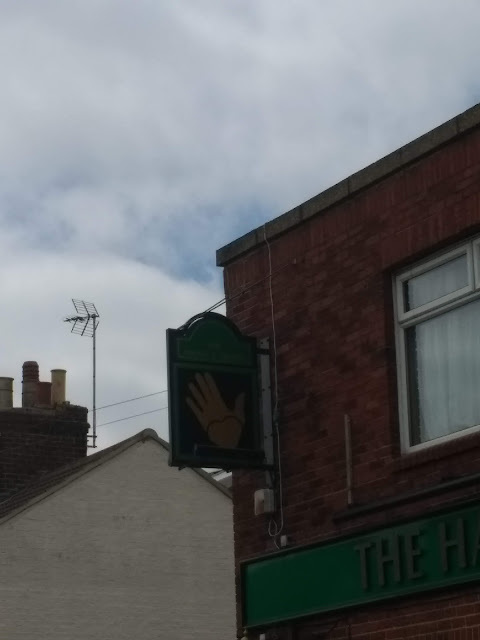 The pub sign, a surreal giant hand either giving a friendly wave or possibly a command to stop, take some time out, slack off and have a pint. I hadn't intended to stop for a drink on this occasion, which was just as well. The curtains were still drawn. They don't open till 3 on weekdays. To my shame I've only visited the establishment once before and I resolved to return at the earliest opportunity. I wandered through the backstreets in the general direction of back-to- work. Further along I passed an unassuming end of terrace building, housing on the ground floor PG Reeves Pneumatic and Compressed Air Specialists, possibly a relic from from the 50s. Above this was the 'Kurdish Association In Britain Kurdish Centre'. A combination that appeared to represent a genuine and most likely wholly accidental mix of cultures. I suppose it might have been the Kurds dispensing the compressed air but in my imagination the shop was run by a man who resembled Roy Cropper from Coronation Street. 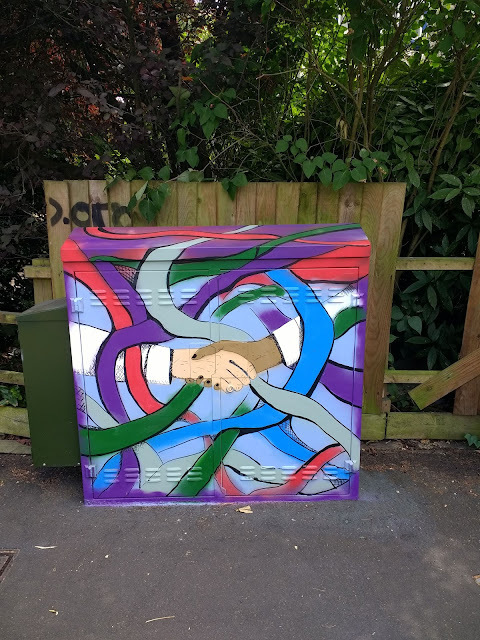 The coming together of cultures was further represented by artwork on an electricity/telecoms box I encountered soon after. Hands shaking amist a swirl of either ribbons or tentacles of a colourful beast. This was part of a series of three 'arted up' boxes in a row, the doing of someone or something called 'Ink Spot'. One of the others depicting trees. The third an old beared man patting donkey and featuring the RSPCA logo. I headed back to work strangely optimistic and refreshed. This despite England getting knocked out of the world cup the night before, the imminent arrival of Donald Trump to these shores and news of the closure of The Golden Curry on Mill Road and it's replacement by a wine bar. It wasn't all gloom.